KOKANEE / EN TEE TUEK represents four aspects of life in the Okanagan. Firstly, the basic rock itself, a menhir or monolith, represents the mineral aspect of this environment. A wonderful aspect of it is that one side, the curved and smooth side, represents and was formed by, ancient glacier action. The next aspect is the salmon motif utilized in the sculpture, which represents not just salmon, but all natural life and the whole ecological system of the Okanagan. 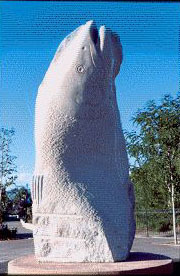 The third aspect is the representation of the First Nation culture, particularly that of the Okanagan, which is illustrated by the design of the female salmon engraved into the glaciated surface. Utilizing this surface seemed particularly appropriate to me, being that many indigenous peoples live in a balanced relationship with nature and since this is the natural surface of the stone it is the right area for this engraving.. The design of the salmon for this side was inspired by several different sources in First Nation art and artifacts. The roe included in the design, as the means of indicating a female salmon, was my own idea. The idea of the engraving came from my recent experiences sculpting in Egypt and studying ancient hieroglyphics engraved onto walls and sculptures there. The fourth aspect is the "Second Nation" salmon, this being the realistic depiction of a male Kokanee salmon, a Sockeye. I chose the Sockeye because its distinctive shovel-shaped nose represents the male and is also a very sculpturally interesting element. My thought was that the world view of the other cultural groups in the Okanagan would best be represented by utilizing a "realistic" motif, in contrast to the Egyptian-inspired engraved surface on the glaciated surface. The fact that all these aspects are conjoined in the same piece represents the unity of the various aspect of life in the Okanagan and by extrapolation, on the whole planet.